Hyaluronic Acid is a naturally-occurring substance found in the body. It helps your cells retain moisture, making your skin appear hydrated, plump, and healthy. When your skin is hydrated, it appears more radiant and is pillow soft. Hydration can cause lines and wrinkles to appear diminished, making skin more youthful in appearance. Hyaluronic Acid is great for any skin type, including those with sensitive or acne-prone skin. Hyaluronic Acid has antioxidant properties acting as a shield against pollution and other free radicals we can’t control. Hyaluronic Acid fillers are usually soft and gel-like. Results are temporary lasting from six to 12 months. Most Hyaluronic Acid fillers have lidocaine (a numbing agent) in them to help minimize discomfort during and after treatment. Calcium Hydroxylapatite is one of the most well-studied dermal fillers worldwide and has been substantially used for the correction of moderate-to-severe facial lines and folds as well as lost volume due to aging. It is a naturally-occurring substance found in our bones. These type of fillers are also soft and gel-like. The consistency is thicker than Hyaluronic Acid fillers, meaning Calcium Hydroxylapatite fillers will last longer than Hyaluronic Acid fillers. Typically, they last 12 months. Calcium Hydroxylapatite also helps stimulate natural collagen production, a naturally-occurring substance in the skin that provides structure and firmness. Calcium Hydroxylapatite is typically used for deeper lines and wrinkles. FDA approved CaHA fillers include Radiesse®. Poly-L-Lactic Acid (PLLA) is a biocompatible and biodegradable synthetic substance. PLLA products are classified as collagen stimulators. They are used to smooth lines and build volume by helping your skin rebuild natural collagen. The injected product dissolves a few days after treatment but then stimulates the body to gradually produce its own collagen. The effects of PLLA appear gradually over a few months, producing natural results. As we grow older, the fat, muscles, bone, and skin in our face begins to thin. The loss of volume leads to a sunken or sagging appearance of the face. Injectable Poly-L-Lactic Acid is used to create structure, framework, and volume to the face. Poly-L-lactic acid is typically used to treat very deep facial wrinkles as well as to correct volume loss, and results can last 2 years. FDA approved Poly-L-lactic acid fillers include Sculptra® Aesthetic. The FDA approved Sculptra Aesthetic in 2009 for improving the appearance of smile and laugh lines as well as other facial wrinkles. Polymethylmethacrylate (PMMA) is a synthetic, biocompatible substance that has been used in medicine for much of the last century. In dermal fillers, PMMA takes the form of a tiny ball that remains beneath the skin indefinitely to provide continued support. PMMA fillers also contain collagen. PMMA is considered a semi-permanent filler and is most often used to treat medium-to-deep wrinkles, folds and furrows, particularly smile and laugh lines. It can also be used to fill out pitted scars, including acne scars. When a more permanent solution to facial wrinkles is desired, PMMA is often used instead of Hyaluronic Acid fillers. FDA approved PMMA fillers include Bellafill®. Each filler is designed to have a different texture, density, and injection depth. Certain fillers work better for certain areas than others. 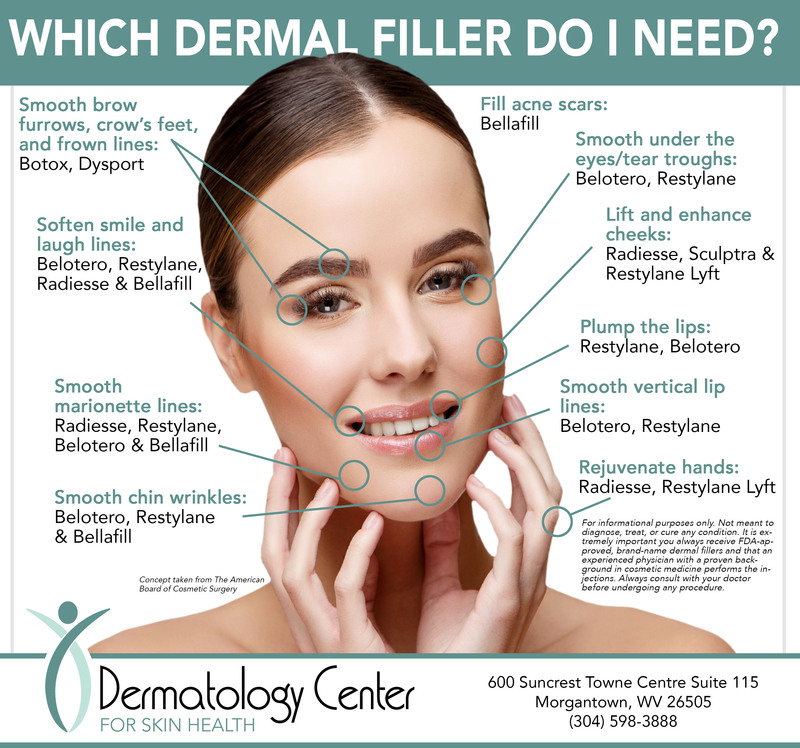 Your provider will determine which filler is best for you. Dermatologists use softer fillers in the lips and sturdier products for cheekbone enhancement. Doctors inject fillers during an office visit. You will first meet with your doctor to discuss your concerns and desired goals. During your consultation, your doctor will evaluate your area of concern and review your medical history. You need to disclose your medical history completely prior to treatment because certain allergies, skin and neurological conditions, and medications can put your safety or results at risk. You need to tell your doctor if you have been taking aspirin, ibuprofen, naproxen, or blood thinners because these increase the likelihood of bruising. The area will be cleaned prior to injection, and you may be given a topical anesthetic to numb the area. Many filler products, like Hyaluronic Acid fillers, also contain lidocaine, which is a mild anesthetic intended to help minimize discomfort during and after your treatment. Your doctor will then inject a specific amount of filler strategically beneath the skin. Depending on the product and the areas treated, you should be able to notice results immediately after receiving filler injections. Some patients experience mild bruising and swelling, but these are temporary and should subside within a few days following treatment. You will be able to go back to your normal activities right after treatment, but your doctor may ask you refrain from exercise or other strenuous activity for 24 to 48 hours. Icing and massage will provide relief for side effects experienced immediately following treatment. However, these side effects will continue to improve within a few days. Your doctor will go over detailed post-treatment care with you at your appointment. Filler injections are still a medical procedure that require specific training, knowledge, and skill to ensure safe treatment and natural-looking results. Make sure your provider has a proven background in cosmetic medicine as well as training and substantial experience performing filler injections. At the Dermatology Center of Skin Health, our physicians perform all fillers. Drs. Maouad and Gharib have extensive experience with a variety of fillers. Their experience reduces the risk of side effects and increases patient satisfaction with proper product recommendations and placement. To learn more about facial fillers or other cosmetic procedures we perform, download our Guide to Cosmetic Procedures, where we cover everything from facial fillers, botox, chemical peels, microdermabrasion, micro-needling to vascular laser treatments. If you’re ready to schedule an appointment, call us today: 304-598-3888.